It is my thankful taste buds that inspired my next recipe selection. It is one brought to me by a neighbor, piping hot. 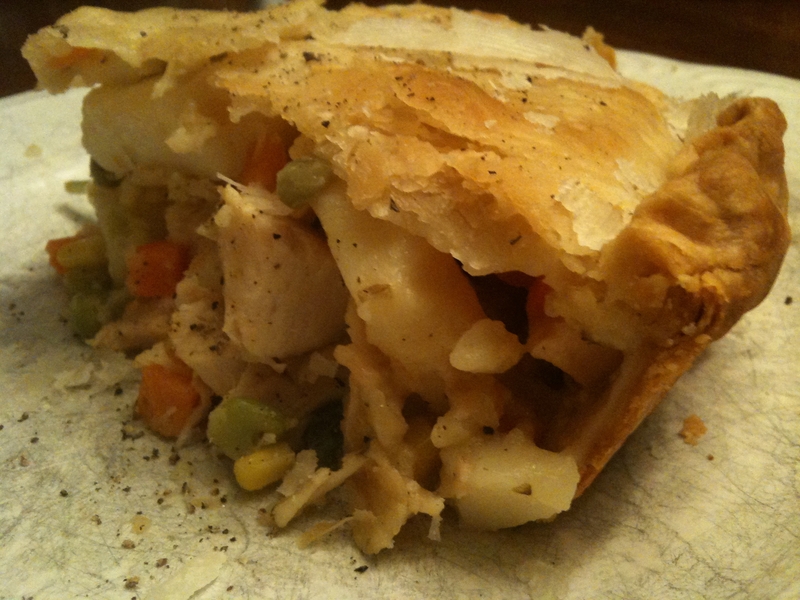 In my Keeper Box, I call it Christine’s Mile High Chicken Pot Pie. Ironically, it is the only recipe I found in my sister’s yellow lemon-themed Keeper Box. She had put it in there all on her own. The beauty of this recipe is that it comes from the tradition of giving someone what they need. It is simply, comforting. Usually I would have chosen to put Sage or Thyme in my Pot Pie. Interestingly, this one calls for Oregano. Oregano, also known as “Wild Marjoram”, is a close relative of “Sweet Marjoram”. Don’t substitute this. It is the little surprise that gives this pie its magic. For me, it is the distant sweetness of the oregano combined with the saltiness of the cheese that gives this pie the ultimate comfort factor. Originally, taken from an article in Parent’s Magazine, I’ve made minimal changes and one addition: sliced potatoes. This addition makes the pie tall, besides one of my picky eaters loves potatoes. I am trying to make it easy for him to be thankful. By the way, that’s not cheating; it is giving him what he needs, Love ; ). *Note: Do not substitute fresh diced onion, it will not work well. In large bowl combine all ingredients except crust. Mix well. Place first crust in 8-inch pie plate. Pour in chicken pie filling. Place crust on top. Tuck edges under, seal and crimp edges together. Cut vent holes in top of pie. Cover pie loosely with foil. Bake at 400 degrees for 45 minutes. Remove foil and cook additional 15 minutes or until crust is golden brown. Let stand about 10 minutes before serving. Comfort in a crust, for sure! Orignal recipe found in Parent’s Magazine and given to me by C.W. Your picture doesn’t look like how mine turns out. It is absolutely delicious, but almost soupy. Everything falls out the inside. Am I doing something wrong? Sorry so long to reply. I do not think your are doing anything wrong if it tastes delish. Yes the pie gravy is very loose (it is not in the picture), but my pie stays together except for the gravy (Photo is just pie with gravy left in the pan). Hmmm, if it tastes good you have the quantities right. Maybe if you want a thicker gravy you could add a thickener (like flour, cornstarch). Is your crust staying flakey? Or is it soupy too? My crust stays together and isn’t soupy. Let me know your thoughts. Also, let me know if you do try adding a thickener and if you prefer it that way. I’d be interested in your feedback. Keepers, all about making them your own. Thanks for taking the time to ask a question and for visiting my site!